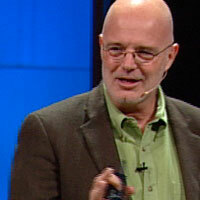 BRIAN MCLAREN A NEW KIND OF CHRISTIAN? From years now of monitoring the neo-liberal cult of the sinfully ecumenical Emerging Church de-formation of the Christian faith aka Emergent Church—that’s now morphed into Emergence Christianity (EC)—Apprising Ministries can tell you that A New Kind of Christian (2001) by EC guru Brian McLaren is a seminal book. For example, in Mysticism’s Gospel Of Goodness And Shane Claiborne I showed you it’s under Recommended Books “On Ecclesiology (theology of Church)” for The Simple Way (TSW). If you didn’t know TSW is the “community of faith” of EC icon Shane Claiborne, one of the Red Letter Christians alongside the likes of his mentor Tony Campolo, Roman Catholic mystic Richard Rohr, and Brian McLaren; by the way, both McLaren and Rohr now happen to be Living Spiritual Teachers alongside such as Deepak Chopra, the Dalai Lama, Thich Nhat Hanh, Eckhart Tolle, and Marianne Williamson. Guilt by association you say; um, yeah. Any chance you’d find…say…an Al Mohler listed there? Now as it concerns McLaren’s highly influential 2001 book A New Kind of Christian; we note that it was published as one of the “Leadership Network Ttiles” by Jossey-Bass, which makes it part of what Christian apologist Chris Rosebrough is discussing in his The Druckerites Must Issue a Safety Recall For Their “Emerging Church” Product Line. Since this isn’t the focus of this article I will refer the interested reader there; for now, it’s also interesting to note that Christianity Today (CT) magazine even gave this book by McLaren an Award of Merit. “I grew up thinking that we’ve figured out the Bible,” Kristen says, “that we knew what it means. Now I have no idea what most of it means. And yet I feel like life is big again—like life used to be black and white, and now it’s in color.” And how did the Bells find their way out of the black-and-white world where they had been so successful and so dissatisfied? Even today under Group Resources at MHBC, should one lack ideas for “finding tools and materials” to use in their small groups, why MHBC has “lots of resources and recommendations” for “leading enriched studies and discussions.” And one of these “recommendations” under Books With Questions/Study Companion just happens to be A New Kind of Christian by Brian McLaren. Let me refresh your memory as to what McLaren teaches via his use of characters which, as it turns out, prove not to be so fictional after-all. McLaren will not accept for a moment the possibility that conservative evangelicalism, which is surely laced with modernistic tendencies, might possibly be resting on the foundation of infallible, unchanging Scripture. No, McLaren is willing to throw the baby (biblical Christianity) out with the wash (modern influences) and start all over with a new kind of faith, one which he admits does not yet exist. McLaren suggests that what Jesus was really about was a holistic reconciliation of God with the whole created order. But if that assertion serves to de-center the cross and the preaching of the gospel, then we would be immeasurably impoverished by following it. His repeated emphasis on the implications of the gospel seem to obscure what precisely is the good news. He fails to combine the better parts of liberalism and evangelicalism. The message of McLarenism is pretty simple: God is love and wants everyone to be kind and inclusive and care for the poor and the environment… In McLarenism there is no original sin, no wrath, no hell, no creation-fall-redemption, no definite future, no second coming that I can see, no clear statement on the deity of Christ, no mention of vicarious substitution or God’s holiness or divine sovereignty, no ethical demands except as they relate to being kind to others, no God-offendedness, no doctrine of justification, no unchanging apostolic deposit of truth, no absolute submission to the word of God, nary a mention of faith and worship, no doctrine of regeneration, no evangelistic impulse to save the lost, and nothing about God’s passion for his glory.